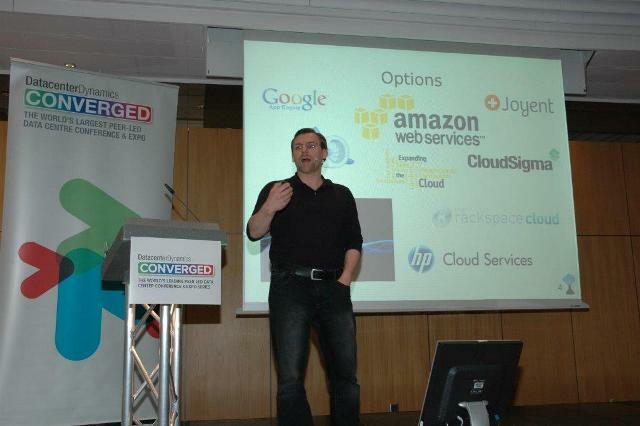 Was invited to talk at Datacenter Dynamics Converged 2013. Very interesting conference, indeed. Latest trends, issues, solutions, hard and software based around Data Centers – all from the perspective of Data Center Operators. Cloud Computing in this case is the workload and there was frequent mentioning of Data Center Infrastructure Management (DCIM), a topic that we, the ICCLab, address in our new project GEYSER from an integrated Cloud Computing and Energy Efficiency perspective. This is a hot (pun?) topic these days and I am quite keen to see substance around this. Can’t tell much more at this stage, but with GEYSER and a new and excellent chap joining our team for that topic we should have all things together. Here are the slides of the talk for download. Dieser Beitrag wurde am August 6, 2013 von tmb in Cloud Computing, Computer Science, ICCLab veröffentlicht. Schlagworte: Cloud Computing, Datacenter, ICCLab, OpenStack.